It was a rollicking episode of 'The Long & The Short of It' this morning, and even taking my personal biases into account, it was hard not to score it 2-0 for the tall man. 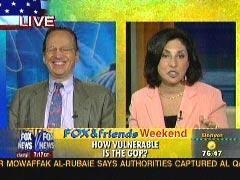 The regular Sunday-morning feature of Fox & Friends Weekend pits long, conservative Newsday and TCS columnist Jim Pinkerton against short, liberal Ellen Ratner of Talk Radio News. The opening topic this morning, in a match refereed by FNC host Kiran Chetry, was a report that retired General and former Dem presidential nomination-seeker Wesley Clark will be issuing on behalf of Democrats this week, intended to "detail the failures of Republicans" on national security. Kiran observed to Pinkerton that even some Republicans are angry that GOP leaders "haven't done more about border security." Pinkerton agreed: "I think the Republicans have made a major error in not getting a wall built and more troops, guards hired on the border. I think that's a huge mistake." Continued the lanky conservative: "However, the Democrats are definitely for open borders, amnesty - all the things that people hate. And, Wesley Clark has yet to change the national Democrats' mind on basic issues like the Patriot Act, the National Security Agency's wiretap program. So if the Democrats are basically pushing the same old ACLU vision of homeland security, then they can still manage to make the Republicans look good." In reply, Ellen had to acknowledge that the Democrats do have to come up with real proposals on security. Ellen chose not to mention that in fact she personally favors . . . open borders. Ratner focused instead on a specific congressional race: "I have a childhood friend, Ellen Simon, she's running as a Democrat in Arizona, District 1. She'll go against Renzi. That's always been considered a safe Republican seat. But she is a Democrat now, who I think has the message. And I think she's going to be one of those seats the Republicans have always counted on and she will probably wind up winning." Pinkerton pounced: "What is her position on the border?" Ratner: "I don't know her total position on the border. But I do know that she is concerned about illegal immigration." Knowing that he had just won the point, Pinkerton broke into the broad grin pictured here. Pinkerton: "'Concerned' is not the same as being tough. The Washington Post sent a reporter down there and this liberal reporter said the most important issue people face down there, that people worry about, including Democrats, is getting control of the border.Not amnesty, not crappy stuff, but real, hard-nosed, wall-like security, and it's a question of what party . . ."
Kiran cut in, but Pinkerton had made his point: when it comes to border security, while President Bush has not been as tough as many would like, Americans inherently understand that Republicans, particularly those in the House, are prepared to take the tougher measures. "We need to secure our border by giving our border patrol agents the resources they need to do the job we're asking them to do and tougher penalties for employers who break the law by hiring illegal workers. The immigration debate should be about our own security, including the security of our borders. Only after making sure we control our own sovereignty can we debate sensible immigration reforms and the relative merits of guest-worker programs, employer sanctions, and other proposals." I'd call that a weak margarita of a border security policy.